Twice Told Tuesday - How Much Is That Baby In The Window? The Delineator Child-Rescue Campaign. For The Child that Needs a Home and the Home that Needs a Child. Photographs were used to bring together the homeless child and the childless home. One of this country's most famous magazines, The Delineator published a Child Rescue Campaign combining sweet photographs of young children with a poignant story told in the style of the time. Was this a Sofie's Choice? Did all seven go, or just these two? Probably the first photographs ever taken of these two young boys. The story of Charles and Vance. Tissues required. 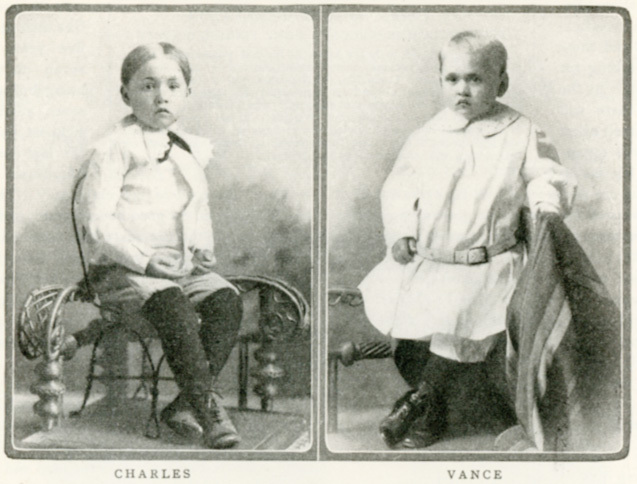 The two little faces who look into yours are those of Charles and Vance, who were considered by the Michigan Children's Home Society, St. Joseph, Michigan, May 2, 1908. Their mother was a woman of good mental ability, and was married when very young, to a respectable young man in poor circumstances. She died at the age of twenty-five, the mother of seven children, the oldest being but a little more than seven years. Overcome by sickness, poverty and distress, she laid down the burden of life, March 15, 1908, with the words, "Be good to my children." The father, unable financially to hire a good housekeeper, and finding it impossible to secure the necessary help from friends and relatives, thought the best way to fulfill the wife's request to be good to the children was to secure help from outside and appealed to the Michigan Children's Home Society, which gave the needed assistance. Then came the parting. Friends and loved ones joined in the good-byes, and tears and kisses mingled. Little Vance was so young that he was quickly attracted by new sights and scenes but not so with Charlie. He did not so easily forget the old associations, and, leaning his head upon the window in the car, he sobbed: "I want to go back to grandma's house." Oh, the love and sympathy needed to comfort these little hearts that are breaking because those whom they have known and loved are taken away from them! Will someone come to the rescue of these two bright, healthy boys, and give them a home together, that they need not be separated? "The Delineator Child Rescue Campaign. "The Delineator, September 1908, 405. What a sad story. I wonder if it's similar to what happened to my great-grandmother and her brother? Heartrending! And how frightening for those boys. Little Vance's outfit is something to behold. The girth of the child causes me to wonder how many layers are under that dress. That is heart breaking. Hope they found a good home together. Too bad granma couldn't keep them. I believe this happened to many families. I only hope Grandma took some of the other five. But, how do you decide which of your children to send away? I can not fathom how the father decided. I've got to find a way to identify them. I wonder what happened to them and the other children? FM: I believe they did it based on the age of the children. Children that were less than a couple years old wouldn't remember much if anything at all about their biological families and therefore the transition to a new family would be easier. At least that's how I figure it. My grandmother and her four younger brothers were orphaned by 1899 when she was 11. She and two brothers were taken in by grandparents, one by a neighbor, and the youngest boy by another neighbor. Her grandparents were also finishing up raising their three youngest. These same grandparents also took in another grandson who was orphaned. My grandmother later married and lost her only son when he was 12 and her husband ten years later. Sad, sad story. It is so very sad, but a rather common occurrence.